During the years you spend in your 20s and 30s pursuing a career and trying to develop a meaningful relationship, your eggs are silently aging. Women are born with all of the eggs they will ever have already formed in the ovaries. These eggs have an expiration date, and there is nothing that can be done currently to turn the clock back. The key to having children later in life is preparation while you are still young. By the time a woman turns 40, she has less than a 10% chance of having a successful and healthy pregnancy. The risks for birth defects grow each year as the eggs become abnormal and break down. However, a healthy 40 or 50 year old woman remains capable of handling pregnancy just fine. Modern reproductive scientists have created a way to freeze your eggs, stopping the clock and allowing you to focus on your goals without worrying about missing your chance for children. Saving eggs when they are in great condition allows you to use them at any point when you are ready to start a family. The procedure for preparing and retrieving the eggs is the same one used for women who choose to donate or sell eggs. The entire process starts with orientation classes and meetings with the doctor. Women considering freezing their eggs must understand the risks and probability of success before they spend $10,000 or more. Since the technology is so new, there is no guarantee that frozen eggs will remain viable over a decade or more. The doctor will discuss your current lifestyle and recommend changes that will increase the changes of successful egg removal. These changes can include smoking cessation or the avoidance of alcohol through the treatment. Once both the patient and doctor agree that the process is worthwhile, the patient begins taking birth control. This will prevent an accidental pregnancy from occurring because shots of stimulating hormones must also be taken for a few weeks. These hormones encourage the ovaries to release multiple eggs at once, instead of the single egg shed during each menstrual cycle. Women who are sexually active will be at a higher risk for pregnancy during this time. You must inject yourself with a daily dose of hormones. If you are squeamish about needles, the egg freezing procedure may not work for you. The fertility clinic will require you to visit at least once a week for monitoring of your ovulation cycle. When the eggs are released by the ovary and are in the fallopian tubes, the actual retrieval can occur. You will be put under mild sedation to prevent any discomfort or pain. The doctor uses specially designed needles to reach the fallopian tubes and capture the eggs without having to break the skin. The needles are inserted through the cervix and uterus without any damage to them. When the sedation wears off, minor cramping is the only side effect most women are left with. You can return to your normal lifestyle the next day. Since there is a lot of high-end technology required to preserve the fragile eggs that hold the key to human life, the cost of egg freezing can run quite high. Most clinics charge about $10,000 per cycle of egg extraction. This includes the extraction itself, but usually does not include storage fees. Ask the clinic or doctor you choose if you must pay an annual fee for continued storage or if the original cost includes it. Overlooking this detail could lead you to spend far more than you originally expected. Storage costs vary greatly, with cryogenic labs charging anything from $100 to $5000 a year. There is no guarantee that your first cycle of removal will produce a viable set of eggs. Many women choose to pay for three or more cycles to give themselves a better chance of having healthy eggs in storage. Consider the cost as an investment in your future family. Adoption and surrogacy, two other common options for children when conception is no longer possible, can cost as much as two or three rounds of egg freezing. Before undergoing the procedure, remember that implanting and fertilizing the eggs will come with its own costs and risks. The eggs retrieved from each patient are frozen, but not in the kind of freezer you have at home. 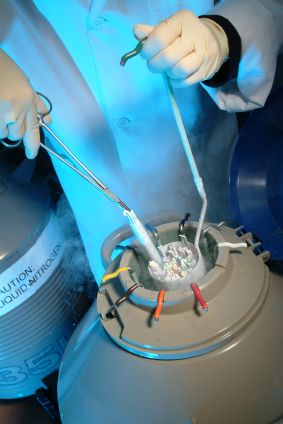 Special machines that produce extremely low temperatures are used for cryopreservation. Liquid nitrogen keeps the entire freezer at a stable temperature. These are the same freezing units used to preserve sperm and umbilical cord blood. Freezing the eggs prevents the degradation and breakdown of the proteins within them. This means that a healthy egg frozen when a woman is 22 should be nearly identical when it is defrosted at age 42. Before the eggs are frozen, they are suspended in a fluid buffer. This buffer prevents the equivalent of freezer burn from damaging the eggs. Known as cryoprotectant, this fluid contains certain chemicals and sugars that form a barrier around the egg. This barrier also prevents damaging during the thawing part of the cycle. Cryoprotectant is harmless and has no effect on the egg's chance of fertilization. It is not clear yet how long eggs can stay frozen and remain viable. This procedure has only been available to consumers for about 7 years, but has been used for livestock for over 20 years. In livestock testing, eggs were shown to last for a decade or more in proper storage. When you are ready to have children, you will need to undergo In-Vitro Fertilization to become pregnant. This treatment involves securing a sperm sample from your husband or a willing donor. The sperm is used to fertilize any of the thawed eggs that are thought to remain viable. The fertilization occurs in a lab so that technicians can ensure that the sperm actually penetrates the outer shell of the egg. Only eggs that become fertilized and start to divide into multiple cells will become implanted in your uterus. Most clinics choose the strongest three or four eggs and implant them all at once. IVF involves a number of tests to ensure you are still fertile and that the uterus is capable of sustaining a fetus. If you undergo these tests prior to having your eggs frozen at 35, you will still need to repeat them at a later age. Scarring can occur at any time and will make you unsuitable for IVF. Before implantation begins, you will go through another round of hormone injections to encourage your uterus to create the perfect environment for implantation. The fertilized eggs are then implanted, and monitoring begins to see if any of them implant properly. Since egg freezing is such a new procedure, there is very little data to determine the chance of success. Each women ages differently, making it impossible to predict if freezing eggs now will ensure a healthy pregnancy later. Many clinics do calculate that women who freeze their eggs between the ages of 30 and 35 have a 50% that they will remain viable for pregnancy. Waiting to freeze eggs until you are 40 will reduce these chances to 20% or less. The chances for successful IVF are also variable, but usually remain between 10% and 30% for healthy women between 30 and 40. There are a number of tests that the fertility clinic can run to determine if you are a good candidate for both IVF and egg freezing. Some of these tests include general fertility measurements, ultrasounds to check for problems in the uterus and ovaries, and hormone response tests. Anti-Mullerian hormones will prevent your body from releasing multiple eggs at once. If a test shows a high level of these hormones, you will likely not benefit from egg freezing. Scarring in the uterus and fallopian tubes will also make pregnancy difficult or impossible no matter your age. There are very few risks associated with the egg freezing process. Some women have adverse reactions to the hormones they must take for egg retrieval. High doses of hormones can upset the natural balance of the body and creates uncomfortable side effects like yeast infections and short term body hair growth. Taking these hormones for long periods of time, a common practice with IVF, raises your risk for uterine cancer. A trustworthy doctor will only administer the lowest amount of hormones necessary, preventing these problems. Calling the first fertility clinic in the phone book is not the best way to choose a doctor for egg freezing. Start by comparing the costs and claims made by local clinics. Call and ask for statistics and hard facts on the clinic's success rate. They should provide you with figures on exactly how many successful pregnancies they've helped create. Look into reviews of the clinic, but be wary of anonymous reviews. Meet the doctors and technicians who will be working with you and don't be afraid to switch clinics if you don't feel comfortable with the team at your first choice.